There’s a new book out for everyone who has questions to ask about how you exercise with diabetes, and it includes advice about low-carb eating and exercise. 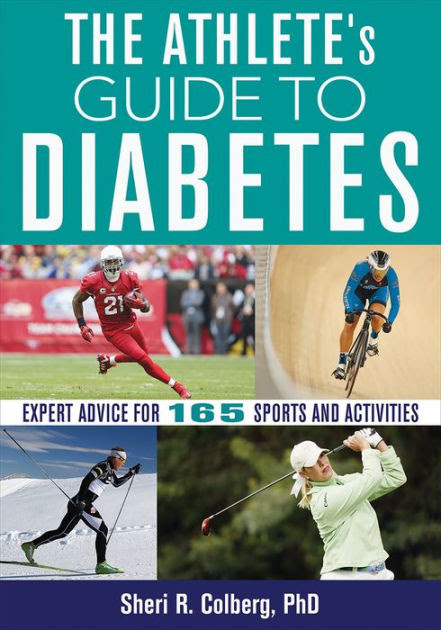 Nearly 300 athletic individuals were included in this new edition, now re-titled The Athlete’s Guide to Diabetes by Shelley Colberg, after answering Shelley’s online survey about their activities and diabetes management. And 15 athletes are included in all-new profiles. Much of the first half of the book has been rewritten to include low-carb eating, the latest diabetes technologies, new medications, and much more. Tips and best practices to deal with device slippage, temperature extremes, and different activities are included as well. There is guidance and unique perspectives on 165 sports and activities. More than 80% of the content is entirely new, and the publisher is offering an online CE exam for anyone who needs the credits. Check it out on Amazon, Barnes & Noble, and Human Kinetics. The Athlete’s Guide to Diabetes – Kindle edition by Sheri R. Colberg. Professional & Technical Kindle eBooks @ Amazon.com. A study published in Heart reports that your resting pulse generally indicates how fit you are. It also modestly predicts mortality rates from the obvious cardiovascular disease but just as strongly with such things as breast, colorectal and lung cancers. A difference of 10 beats per minute equates to a 10-20% difference in mortality. Also reported in Neurology, Swedish women had their baseline fitness tested in 1968 by ergometry while cycling. There neuropsychiatric status was checked at intervals since. Women in the highest fitness group delayed in onset of dementia by 9.5 years compared to the low fitness group and by 5 years in the medium fitness group. Keep it up Emma, all that running about is doing you good. Meanwhile I’m sitting here typing with my resting pulse at 56. Maybe I don’t need to? Videos of the lectures given at the Public Health Collaboration conference 2018 which was held in May over the royal wedding weekend have now been released on You Tube. You can see my talk, Achieving your optimal blood sugar target, as well as others, on the link below. There are a wide variety of lifestyle topics discussed. Happy viewing. The half-marathon training continues… limps on, more like. My body repeatedly tells my brain this was not wise. Sheer stubbornness forces me on. It heartened me to read of another type 1 saying her training veered between 20-mile runs that went well and three-mile runs that floored her. We juggle not only the effort of running with balancing blood glucose levels. Too high and running turns into an activity that resembles wading through waist high treacle. Too low, and your calves seize up as your body goes on a glycogen hunt. Either way, both states bring you to a grinding halt. If you can work it out, you’re better at this lark than I am. Exercise affects us not just at the time but for up to 24 hours afterwards. And if you’re exercising for more than an hour at a time, it becomes trickier to work out what you need to do with insulin and food. Bouts of activity that last half an hour to 45 minutes are relatively easy to manage. If you want to do more exercise than this, you can break your activities up—a walk in the morning and an easy jog in the evening, say. And plenty of Pilates and yoga thrown in for those nice stretch and flexibility benefits. My vow is post September 30, I’m never doing a run longer than a 10k and my weekly runs won’t add up to more than nine miles, if that. Dear reader, I make myself accountable here. Meanwhile, September 30 (the half-marathon date) hurtles ever nearer. Yikes! An Australian study has shown that getting a good sleep at night and being active during the day was the most effective way to boost mood in retirees. 105 people took part in the Life After Work study. They were followed for six month before retirement to 12 months afterwards. They carefully logged their activities and their mood was measured. The time spent on chores, physical activity, quiet time, screen time, self care, sleep, transport and work, all changed over this period of time. The most favourable substitution was replacing work time with physical activity and sleep. Replacing work with screen time and social activity showed less effect on mood enhancement. After retirement, depression, anxiety and stress all reduced. Post-run blood sugar today. Ten out of ten for me (for smugness too). Good people, the woman who signed up for the Glasgow half-marathon in January uttered various predictions about running in Scotland. Most of them involved rain. As it turns out, my lightweight shower-proof coat has needed minimal use. Instead, I’m reaching for the sun cream and hugging the walls in a bid to stay in the shadows as I pound the pavements. Smell that sizzling tarmac! Scotland has just reported its hottest June ever. Let’s give a shout-out to the poor polar bears in Aviemore. Fortunately, I’ve discovered I can run in the heat. Again, not something I’ve had the chance to test out much over the years. When I trained for a half-marathon ten years ago, there were two hot days in May. I ran during them and hated it. My half-marathon is three months away. I’ve yet to go farther than six miles. Most training plans are for 12 weeks, so there’s still plenty of time to add them up. I’ve found my ‘pace’, a super-slow snail-like jog. I’m hoping my general fitness will stand me in good stead, so that if the pre-race miles don’t stack up, those walking miles will cover ‘em. I ought to join a running group too. Nothing like surrounding yourself with like-minded idiots people to spur one on. And they might know some different routes. I run the same roads all the time, favouring the reassurance of knowing at what point I draw on my reserves of energy and where I get excited because the end’s in sight. Not so! Ten minutes in and I decided I’d have been better off running outside in the blazing sunshine. The heatwave here is set to continue. I’ll be training in high temperatures for a little while yet. Again, I’m hoping this magically builds up my fitness so that when I do talk myself into running more than six miles, it’ll be easy. I’ve joined the Fitbit world. Having dipped my toe in the water via the Jawbone Up Activity tracker, I’m now the proud owner of a Fitbit. My Up activity tracker vanished in January when the device fell out of the wristband. It must be somewhere in the house. Maybe the system thinks I’m dead thanks to my lack of movement. Hey ho! Anyway, by that point I reckoned I knew what you needed to do to cover 10,000 steps a day, and I was quite happy to live tracker-free. I didn’t stare at my phone so much. My health didn’t take a nosedive, and the world didn’t end. On Valentine’s Day, however, my husband gave me a Fitbit Charge 2, the reward for staying alcohol-free so far this year. To be honest, when he hinted the other week that he’d got me a pressie for my teetotal efforts, I thought he was talking about champagne. It always makes sense to reward your giving up something with the very substance you’ve been avoiding, hmm?! And I was grateful and touched that he’d bothered. He’d done the research, he told me happily. This tracker is the all-singing, all-dancing one! It counts your steps, how often you climb up stairs (you should climb ten flights a day for good health, apparently), checks your heart beat, auto-recognises different exercises and monitors your sleep. You can add in a food tracker and monitor your calorie intake if you want to lose weight. For someone who tends to obsessiveness, this is good and bad news. To prevent myself repeatedly checking my phone, I downloaded the app for Fitbit onto my tablet instead. Exercise is very good for we folks with diabetes if you are able to be active. If you have type 2, you might be able to control the condition through diet and exercise alone. If you have type 1, exercise will mean you can reduce how much insulin you need to take overall, and it can be used with diet and insulin to keep your blood sugar levels in range. At some point, perhaps activity trackers will be prescribed for people with diabetes? In the future, the Fitbit could include blood glucose monitoring, as a story earlier this year reported that Fitbit has just invested in a company that’s developing a minimally invasive glucose tracker. Imagine having all that information available in one place. I, for one, would love that capability, so fingers crossed.